Hrishikesh Raghavan is the kind of guy who calls a spade a spade. He called me yesterday. Oh no, he did not call me a spade—called me as in a real ISD phone call. All the way from India. (Yeah, it always melts my heart when people call ISD, especially from India). A long phone call—we talked and talked. I felt so good. Did I hear you ask Hrishikesh who? I guess I forgot to tell you about him. Hmmm—where do I begin? I could tell you that he is a driving enthusiast or a Motoring enthusiast who has done more number of miles in off roading events than the number of times you or I have had haircuts in our whole lives :-) [ In case you don’t know what Off roading is click on link] And in case you still aren’t impressed and want very minute and exact details see this, this ,this,this, this and finally the Golden quadrilateral drive which was done in just 4 days. Hrishikesh is big on cars (biased towards Tata vehicles he adds) having driven about 42000 km in an Omni, 97000 km on the Indica (so far), 67000 km on the Safari (so far). You’d be forgiven for thinking that is all he does. No—like the rest of us, he does have a full time job and is in a senior level position in a leading global IT company. Funny thing is the image of Hrishi ( when you've known him for as long as I have you're allowed to call him Hrishi :-)) that is frozen in my mind is that of a 17 year old, tall lanky lad. That might be because we went to school together and then lost touch for about nineteen years. Then one fine day, thanks to the Internet and all the batchmates reunited sites, just as suddenly as we vanished out of each other’s lives, we were back in touch again. A quick exchange of mails led to an exchange of phone numbers. I was living in Bangalore at the time and he was in Chennai. So we spoke occasionally on the phone and I remember thinking he still sounded the same. His sister who was our junior at school, was in Bangalore at that time and she dropped in for a meal one evening. It was fun catching up. Then I moved to Pune and ironically Hrishi moved to Bangalore. So we still didn’t meet. But we kept in touch through our alumni association of our school which is very active. 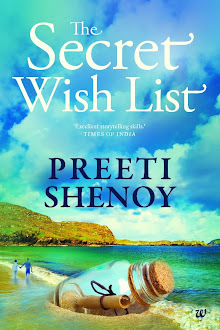 Then one fine day, on a Sunday morning I get a call from Hrishi saying he is in Pune and whether we could meet. But it was too short a notice for me and my diary for the day was jam packed. He was staying at the other end of town and was going back early next morning. So we made loose plans based on a thousand contingencies which left as remote a chance of meeting as Australia has of winning the T-20. I was dropping my daughter to dance class and had to pick her up in an hour and fifteen minutes. I suddenly get a text from Hrishi saying he was on MG. Road and which part of the city was I in? I was just two kilometres away from him and wonder of wonders (unlike Australia winning the T-20 this time) we managed to meet after a dozen frantic phone calls of ‘where are you’, “I can’t see you yet”. Being a Sunday, MG Road in Pune gets converted to a walking plaza and all vehicles are banned and the atmosphere is very carnivalesque. We managed to locate each other guided by the Giant bouncing castles (there were two of them to cause confusion on a 1 kilometre stretch). I had no idea how Hrishi looked like now, as we had not exchanged any photos and the last we saw of each other was nineteen years back. I didn’t know how I would recognise him, but I knew I would. 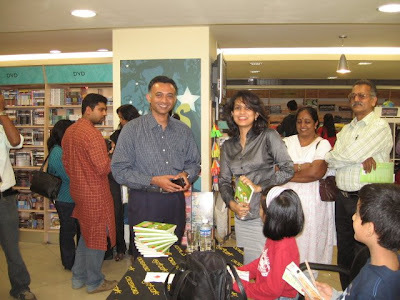 In October that year when I had my book launch at Crossword Bangalore, Hrishi came for it. (see picture on left) He stood silently in the background watching the whole thing, watching me sign books, doing the talk, doing the photo sessions, answering the reporters (click here to see a video of a collection of a photos of it) and he quietly clicked photos. I felt so bad that I could not even talk to him properly. Then when everyone had left, I quickly dialled his mobile—and he was still waiting. We had dinner together and I introduced him to my family and close friends who we were staying with. We went for a drive in his SUV and I felt happy that he got along so well with my husband and with my friends. I secretly felt proud of him too to boast that he was my good friend. Should thank Sir Tim Berners-Lee for inventing the web and help us catch up with long lost friends..
lovely post Preeti and Yes! I totally agree with you on the enormous power that love and friendship has. Amazing post. It was lovely to read and I had a happy feeling at the end of it. Can't thank internet enough. I found lots and lots of long lost friends through it. and very nice of u to remember the friend AND the day n acknowledge it!!! Thanks to the alumni organizations and social networking sites, people don't just vanish anymore. That off-roading bit seems fun. Oh yes - the internet makes such wonderful things possible. Nice post. But you and your friend made that effort to meet and stay in touch ,its so difficult to do that these days. Besides it is difficult to find good friends, i have found a couple and will never let go :)After coming to a foreign country ,i have started to value my friends more then ever. I tell people about how we all finished school and college way before the internet made its way into our lives... and how nice it is to catch up after 10-15-20 years. George Clooney? The salt and pepper probably caused that... I'm still in the Gregory Peck mode. In fact, on Friday night, at a party, I was telling folks about Hrishi and my friend said, "Oh my God, he's the older one... I thought he's a much younger brother... with all that driving around." It’s so true when you say Love and Friendship have a power. And the amusing part is you don’t even realize that this is the power that makes you go on in life. Its like air, you can’t touch it, you can’t see it..... But it’s there. And just when you are too breathless to carry on, it rushes to you embraces you and gives you all the strength you required. It’s just beautiful. Also, yes you do look like a model. I still can’t believe the fact that you are a mother of two. What do you do???? that was a nice one.. as usual anyways.. hehehe.. cant expect nothing less from a write of yours rite? hmmm..
i think there's really no words to express the feeling that we have when we sit back and think of the people who come into our life.. specially if we have lost them for pretty long time to have actually forgotten their existence and there.. one fine morning you get to meet them and then slowly they once again, they share it all in your life. :) Enjoy your day! You have the time for EVERYTHING in the world! !And for everybody....Yet,maintaining yourself as a model after 35 years and having two kids?? What specimen are you?And what material are you made of?? I totally agree. With good friends time definitely does not matter. Very true! Just yesterday I encountered a long lost school friend who is now married and with a kid!! (Wow!!). And when I left school, I thought it was the end. Apparently it isn't. We really don't always decide when it's over. I got all nostalgic thnking about my long lost friends. I have been writing a post for many weeks now about my long lost friends and friendships over the years. Hoping someday they would read my post and locate me. Such a lovely write-up about friendship Preethi!!!!!!! Reflections: Thaaank u.. I think Shilpa shetty has beaten me to it :) heh heh heh..No secret really. I eat healthy, do weights, yoga and I cant sit still :P will write a post about it. Life begins: You know, I have located many friends but its not with everyone that you feel the same warmth because people change. If one finds it one should cherish it. Stillness speaks: You have seen me countless times in my sweaty fitness gear (invariably I wouldnt even have showered whenever you came home :P) You know the secret already! :)Yes you did say but then you are always very very kind :)--Thank u so much! Still thinking; but some people change. Thats sad as you no longer have the same wave length as before. School had a psorts hostel attached to it. I used to play basketball at national level one time--so I guess it might have been all that effect. When you're surrounded by guys from sporst hostel you'd be pressurised to keep fit. Santasizing: Will blog (in fact i think i already have--its somewhere in my archives)! :) Thanks so much!! Savitha: LOL ROTFL..really had to stuff a hankerchief into my mouth to stop laughing when I read your comment else husband who was sleeping next to me would ahve woken up! :D Finding your comment very hilarious but in a nice way. Sandya: Thank you so much for your kind words. Meira; i read your post. Will comment soon. Amsko: Walking plaza is really lovely isn't it? Will write a post on what i really do. Thank u!!! Raaga: Have linked your blog post your comment. Sorry--i had forgotten that you have a blog too. Yeah some images do get frozen dont they? And Hrishi is remarkably fit. He'd any day give a 25 year old a run for his money--dont you think? Thoughtfultrain: i hear you! :) Yes its nice meeting up--but sometimes you just dont get along even though u were friends in school. I guess after a long gap like 10-15 years people change. Poonam1: After coming to a foreign country I do so know who matters and who doesn't! Ajay: :-) I watched the video twice after your comment :-) And for off-roading you really need BFB ;-) And despite the Internet you can lose touch with people if you don't want them in your life anymore. Pavi: Remembered the day just by sheer coincidence :P when i was looking for the photo to put up I realised date was same! Varun: Of course you're there in the video.Thank you for attending it! And thanks for the compliments. Krish: Only sometimes love leaves tears. And sometimes friendship too leaves tears. Nice post. Glad to know that you were able to meet your pal, after many years. I have a childhood friend right from my PRE KG till high school. He moved to US for his higher studies and is now settled in the Bay Area, SF working for an IT major. I last saw him after our school finals. I ‘searched’ him in Orkut and was able to smoke him out. Now he is married and has a kid. I have missed him within few minutes at airport once – I just thought of calling him, just like that, after a very long time, as I had enough time to kill since my flight was delayed. I was surprised when he said that he was in Bombay and was in the airport. While I waiting for my departure, he was just about to climb the bus towards the tarmac and we were about to take diagonally opposite flight directions – me to Chennai while he was heading to Frankfurt. That was a miss… Sometimes over phone, when we chat and refer about this, never did we miss a laugh(and also the hidden sadness). Your post kindled a bit of nostalgia. May be one day I would meet him somewhere like you! Ram Pyaari: :-) Thank you. Really nice post on love and friendship. Wow, nice to know how you and your friend have reconnected after many years. Cheers to the both of you! Thank you Mr Burners-Lee, without you how on earth could we have access to all our long lost friends and do all "things" that we do now..But sadly people still (i mean a lot of people who still use INTERNET) do not understand the enormous power of the "NET". Love for me is the heart and friendship is the soul of life. And i am blessed to have a loving family and a bunch of gr8 friends. It just makes life special..
Shatharam: True. Internet is great. But getting together with old friends dont always have happy endings. Cherish the 'meeting-after-this-many-years' moments like this..coz you are hardly gonna get those kinda moments in the future..thanks to the social networking sites like orkut n other technological advances..:)You WILL be in touch with your friends forever..Dont you think? and a big CHEERS to the friendship of you and Hrishi(heehee am taking the freedom to call him Hrishi too)..!! I met my first cousin recently after 15+ yrs...he lives in Canada and was visiting San Franciso for work, so I drove down to see him....felt SO GOOD. Pallavi: See my comment above to Santasizing. I have given the link to the post I had written--and that post has a link to older post as well. Both are on fitness. Gils: Been there, done that. Scroll down to my post 30 nosey questions and U'll see that i have even put up a picture. A mention of a bloggers meet is there in one of my older posts as well. I used to write for TImes of India and an article about it written by me has been published. Shachi: Oh yes! When it turns out great the feeling is marvellous. Geetha: When you have commented on by blog as many times as Geetha has, you're allowed to call him Hrishi too :D :) And u know what--despite the social networking sites u'll be in touch only if you really want to..
Preeti, I am flattered and honoured to feature on your blog. I was thrilled to get back in touch after so many years and that meeting at Pune was something else! 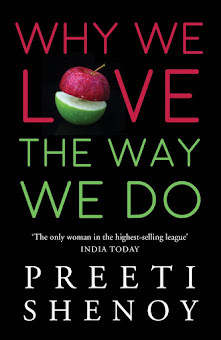 Folks, I cannot describe the pride I felt when I watched Preeti launch her book - sure does feel nice when your school classmate is the centre of attraction. Australia... T-20... Finally cricket getting the better of you. Doli:Thank you! Books caterer (link on right side of my blog) does deliver to US. It will charge you 17 dollars. If you buy it in India, its INR 100.
guess friendship does have a power.. It had been too fast for me to keep pace with you during 31 but did visit at times to catch up. Read 30 things and felt honest answers. It feels so good to meet old friends. PS : Looking for your views. absolutely - it is specially true for school friends. Sometimes I am grateful for all that technology though at times when I am hooked to it I wonder where did all those magic of the letter writing days go. It is such a coincidence - my husband is another auto enthusiast, a team bhp-ian and knows Hrishi quite well. In fact, even I met him once last year on one of their drives to Yercaud. Truly amazing!! Nice! Somehow I feel we connect to our school friend much better than frineds we make later in life. May be because they knew us before we were someone or anyone.